Today’s guest blogger is Clyde Warren. 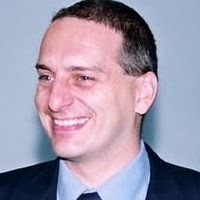 Clyde is a Professor of Chinese Consumer Behavior at the University of Stirling (Singapore) Institute for Retail Studies and at the National Chung Hsing University (in Taiwan). Recently, Clyde implemented an Open Wonderland project for a business class in Taiwan which he talks about below. Clyde may be reached at: clydewarden@gmail.com. 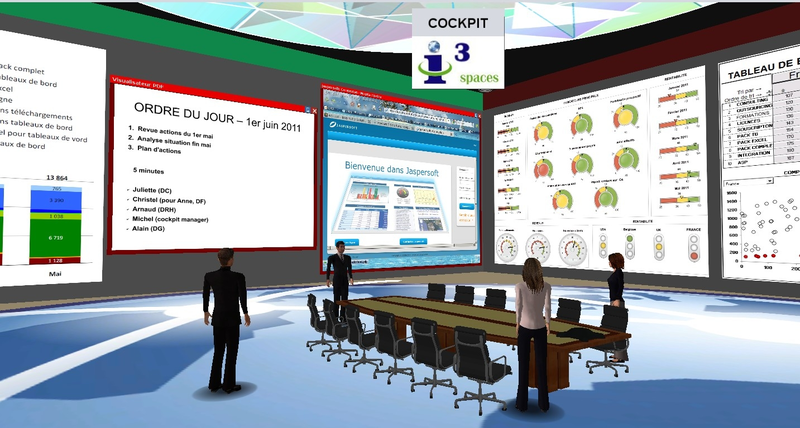 How real does a virtual environment need to be for users to feel presence? 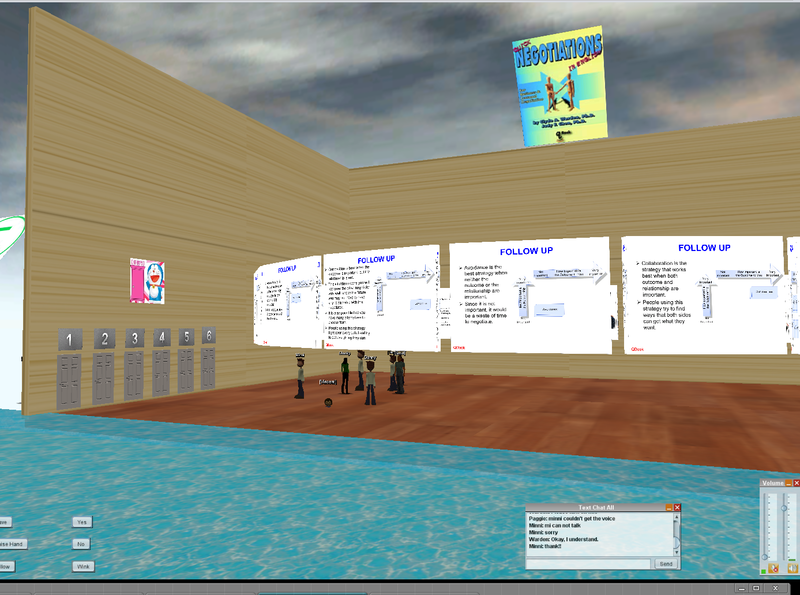 This is a question educators have been researching in the attempt to implement virtual spaces to expand the classroom. For those of us old enough to have been playing eight bit video games and text-driven adventures, we already have a good feeling for the answer—not much reality is required. Quantifying this answer has been my research topic over the last couple years, and Open Wonderland is open road, making it possible to perform structured experimental designs educators and researchers will find most useful. Open Wonderland’s freedom (as in free speech) allows, and even encourages, users to create worlds and tools that match exactly what is needed (in my case, a controlled experiment that incorporates existing teaching materials). Open Wonderland allows the implementation of nearly any metaphor that can reinforce underlying goals and teaching points, and those metaphors, even if somewhat abstract, raise feelings of presence among participants. In Taiwan, where I have been an expatriate for a couple decades, my business negotiation class was the focus for an experiment using OWL. Over the past five years, I developed a pen and paper negotiation Role Playing Game (RPG) where groups of students bought and sold simulated products, negotiating details of price, quality, shipping, etc. 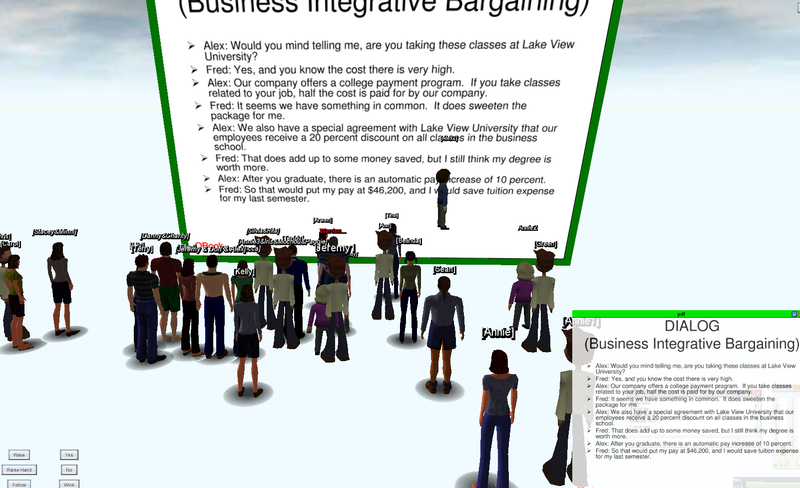 One big problem was trying to simulate negotiations in a tiny classroom, where getting any privacy was impossible. OWL overcame this problem through virtual space, which I then used to test feelings of presence. I measured feelings of presence among students in two different virtual environments—one high abstraction and one low abstraction. Rather than produce a realistic environment, the goal was to test a metaphorical environment. For my negotiation class, a key concept is the importance of the negotiation team, keeping core information secret, planning goals, and distributing work, while having access to members of other teams. For my class, I implemented an island metaphor, within OWL, with each team owning its own island and class lectures held in a central classroom location. This became the low abstraction environment in the experiment. If this setting produced a measurable feeling of presence, the benefit would include those feelings as well as the opportunity to use a metaphor in teaching. This setting was compared to a fully abstract environment, where students negotiated and lectures were held in an empty space that only included teaching materials, such as slides. 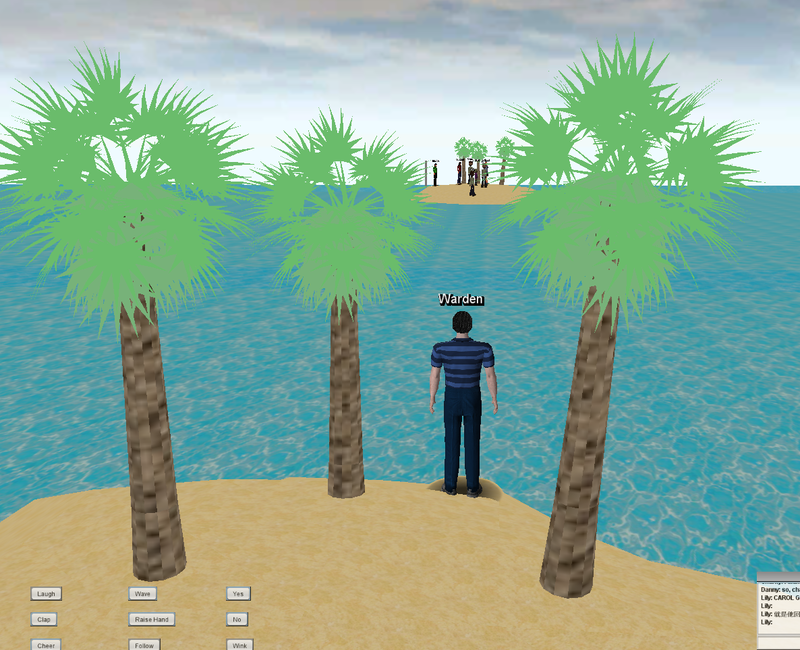 Research results showed students had statistically higher feelings of presence in the island metaphor world compared with the totally abstract world. The RPG paper game was executed, but now with students negotiating inside OWL, alternating between the two environments (low and high abstraction). Even with a small sample size (low statistical power), results were strong. While a difference between an empty world and a non-empty world may be obvious, the important finding is that a metaphor-based world can generate feelings of presence, avoiding the need for a high fidelity simulation. Rather than having offices, desks, and chairs, the island metaphor gave students a lasting picture of a key negotiation concept that they will remember. The details of this work were published in the highly ranked research journal Computers & Education (Level of abstraction and feelings of presence in virtual space: Business English negotiation in Open Wonderland, Volume 57, pp. 2126-2134). To learn more, visit http://cwarden.org/. I’m pleased to announce that the Subsnapshot Importer Exporter module is now available in the Wonderland Module Warehouse. As many of you know, this was our first completed Wonderland Wednesday project. Community member Bob Potter described the project when we started it almost exactly a year ago in his blog post “Wonderland Wednesdays Subsnapshot Project.” As I reported in the Next Wonderland Wednesday Project post, we officially concluded the project at the end of May, but it has taken some time to finish up a few loose ends and create a downloadable version for the Module Warehouse. You may already be familiar with the Wonderland concept of a snapshot. That’s a way to save the state of the virtual world so you can restore it at some later date. Snapshots are a crucial tool for saving work, but they can only be used to save the entire virtual world and they also require a server restart. Subsnapshots, on the other hand, allow you to save one or more individual objects by exporting them to a file on your computer. You can then import the saved content into a Wonderland scene on the same server or on a different server, assuming the Subsnapshot module is installed. This diagram illustrates the concept. The large blue circle at the top of the diagram represents a snapshot of a world that contains six separate spaces. If you wanted to re-use the Teacher Commons space on another server, you could save a subsnapshot of only this space. Likewise, if you just wanted to save a subset of the objects in that space, you could make a subsnapshot that contained only a few objects. After installing the Subsnapshot module, all objects in your world will now have an “Export” menu item added to the right-click context menu. To export a single object, simply right-click on it and select “Export.” You will be asked to name the file and select a location on your hard disk to save the item. Once saved, you will end up with a .wlexport file. To import this file, simply drag and drop it back into a Wonderland scene. If you want to import it to a world on a different server, remember that the Subsnapshot module needs to be installed first. It’s a bit more complicated if you want to export multiple objects. To do so, you must first put all the objects into a single container. A container is a Wonderland mechanism for grouping objects. 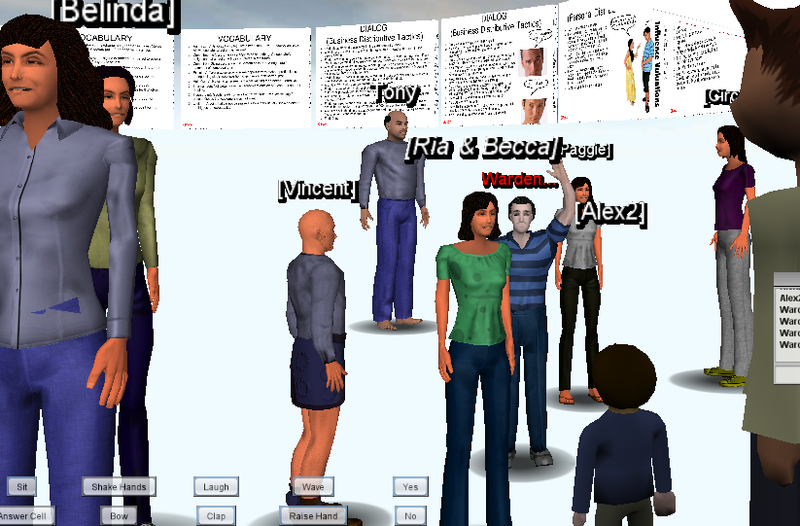 To create a container, select one of the objects in your group to act as the container or “parent” object. I usually select either the largest object or the ground plane object (e.g., the grass or the floor). Right click on this object and select “Properties…” to open the Object Editor. In the Object Hierarchy pane, drag the name of each of the other objects onto the name of the container object. You will now see the smaller objects displayed as “children” of the parent object. Once you group all the objects into a single container, you are ready to export the group. Returning to the Wonderland scene, right click on the parent container object and select “Export.” Everything now works as above. You will be asked to name and save the object. This saves a .wlexport file on your hard disk. When you drag and drop this file back into a Wonderland world, the entire group of objects will be imported. This short video demonstrates how to export multiple objects. While the Subsnapshot module is usable in its current form, it still needs a bit of work, particularly to improve usability. The biggest problem is that there is currently no feedback to the user on the status of either the export or the import. Some large containers may take a considerable amount of time to export. Right now, you need to check your hard disk to see when the .wlexport file appears. When importing, there will be a bit of a delay when you see nothing happening and then “Downloading” messages will appear in the lower right of your screen. When the downloading messages stop appearing, your set of objects should be visible. In both cases, we would like to add progress bars to show the status of the import or export. Another feature we hope to add is the ability to export directly from the Object Editor window. We also hope to allow users to dynamically select multiple objects for exporting without requiring the use of a container to group the objects. As you use this module, please don’t hesitate to suggest other features or usability improvements, either in comments below or on the Open Wonderland forum. And if you find bugs, please report those in the Issue Tracker. One of the great features of Open Wonderland is its application-sharing facility. And one of the benefits this provides is the ability to use OpenOffice in-world to create and edit documents that are compatible with Microsoft’s ubiquitous Office suite. But what if you just want to show a document in-world without the overhead of application-sharing? Or, what if you’re running your Open Wonderland server on a host, like Windows, that doesn’t provide application sharing? Well, the long answer is to open your document, save it (or print it) to a PDF, and then drag-and-drop the PDF document into your Open Wonderland client. For the +Spaces project we needed something easier; something that would enable users to easily share their documents with other users in the context of a debate about policy proposals. A new module in the Open Wonderland Module Warehouse streamlines this process by allowing you to drag-and-drop any text document, spreadsheet or presentation supported by OpenOffice (in addition to its own file formats, of course). The office-converter module relies on a little advertised feature of OpenOffice: its ability to run in headless server mode. The module bundles the open source JODConverter software to provide a web-based API to OpenOffice and adds the necessary hooks into the Open Wonderland client and server so that it all works seamlessly. In the movie below, I demonstrate how to drag-and-drop common Microsoft Office documents into a wonderland client. And here, an interesting use case that extends the functionality of the office converter by combining it with the PDFSpreader module. The iSocial project is pleased to announce our first open source release: Styled Sticky Notes. Styled Sticky Notes is an idea that was proposed in May of 2010 as a mashup of the poster module and the sticky notes module. The idea was to come up with a way to present styled text and graphics and to allow for text input on a sticky note. Lots of good feedback was generated on the forum from the proposal, and the design was changed significantly. The result of the design changes was a set of sticky note variations that would support display and editing of styled text. The Wonderland iSocial Styled Sticky Note module expands on the existing sticky note module by adding two new types of sticky notes. The existing sticky note module has sticky notes (simple text boxes where you can write plain text notes) and task sticky notes (which track the status of a to-do item). The new sticky note module provides Styled Sticky Notes (simple text boxes where you can write styled text notes) and Sectioned Sticky Notes (sectioned text boxes where you can write styled text notes in the top portion and plain text notes in the bottom portion). 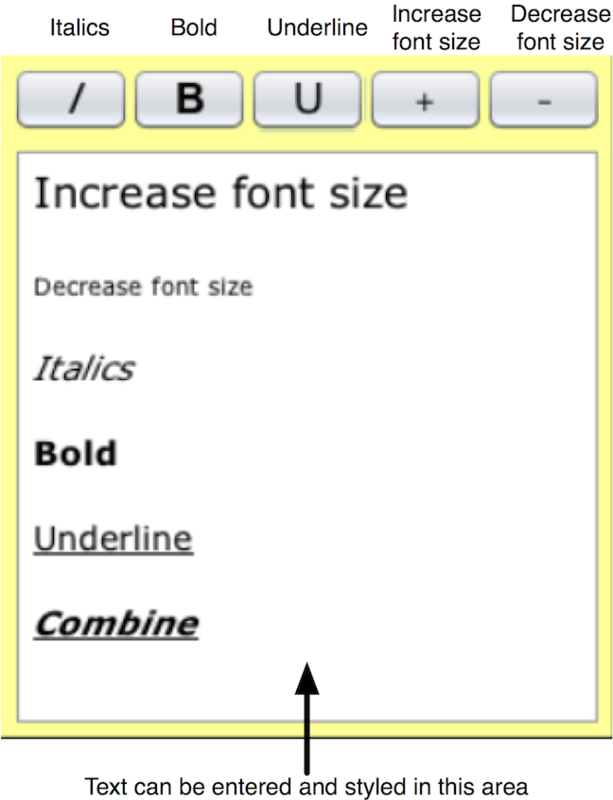 The Styled Sticky Note has controls for changing the style of text in the note. To change the style of text in the note, click and drag to select the text you wish to style, then select one of the style buttons. See figure below. The Sectioned Sticky Note has controls for changing the style of text in the note only in the top panel. Text in the bottom panel is not able to be styled. To change the style of text in the note, click and drag to select the text you wish to style, then select one of the style buttons. The intended purpose of Sectioned Sticky Notes is for providing a way for users to respond to queries in-world. A query is entered and styled in the upper panel, and the user provides a response in the lower panel. An example is provided in the figure below. The iSocial Styled Sticky Note module can be downloaded from the module warehouse. Its source can be downloaded from the unstable module repository. We hope that the community finds these extensions to the sticky note module useful. Please feel free to provide feature requests and bug reports on the Wonderland forums. 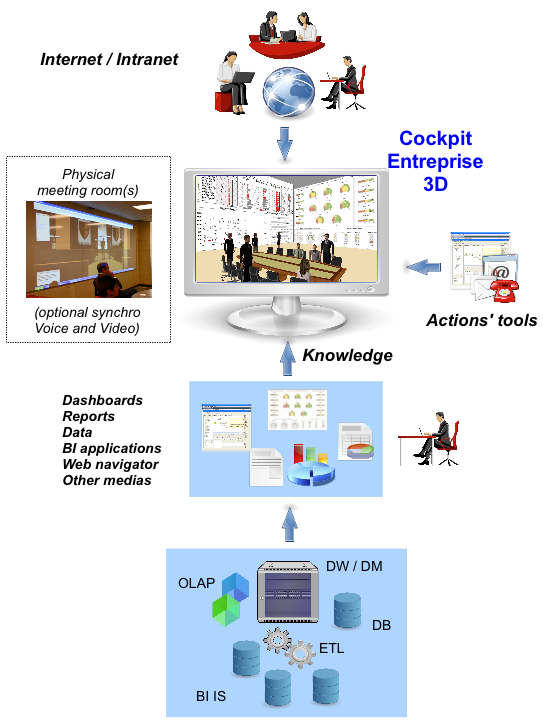 Like in airplane cockpits, the management of an enterprise requires gathering the three main engines of the modern enterprise: the decision makers, the knowledge (e.g. business intelligence dashboards and applications), and the tools to start implementing the decisions and roll up the actions. Absence of key decision makers at some important top-level management meetings which often prevent top-level managers from making fast and quality decisions at the right time. Audio communication with external people. Integration of existing business intelligence tools and infrastructure. Integrated telephony functionality, allowing external users to join the discussions, participate in the decisions, and … get the actions! Tools to create “mixed reality” environments that synchronize video and audio in real time between physical meeting rooms and the virtual cockpit. As some of you may know, we began holding Open Wonderland “office hours” a while ago. We took a break for the summer, but office hours are returning in September. Please take a look at the Office Hours Schedule and mark the times on your calendar. I’ll be hosting the first office hours session of this “semester” today (Thursday) at 4pm US Eastern time. Those of us who volunteer to staff office hours want your company! Notice on the schedule that each person who volunteers to staff office hours has indicated their areas of expertise, so take a look at that list before deciding on which office hours session to attend. Also note that different volunteers have chosen different servers for their office hours, so double-check the meeting location. 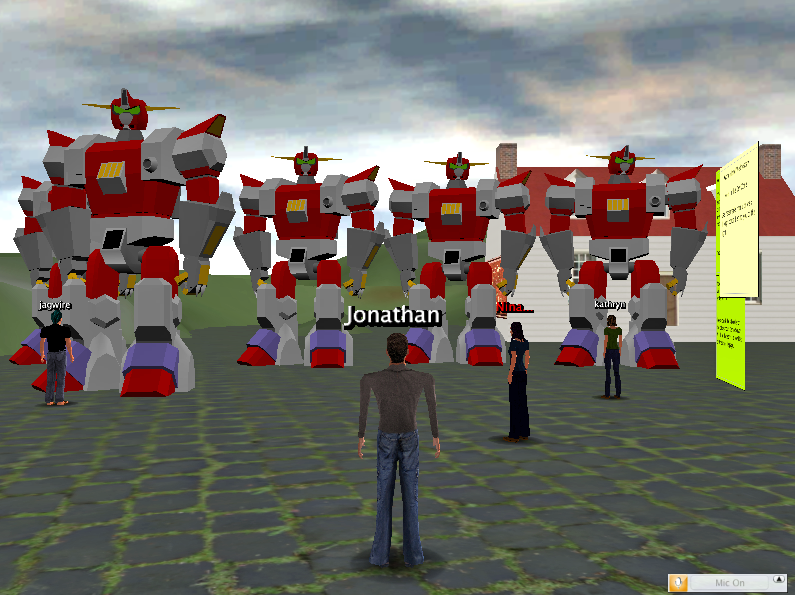 Jos will even meet you on your own server, if you wish. Just contact him via IRC and provide him with the URL. He’s also happy to meet you on one of the community servers. The rest of us will be logged in to the specified community server waiting for people to come visit. Anyone in the community is welcome to volunteer to staff office hour sessions. In particular, it would be great if someone in an Asia / Pacific timezone would volunteer. Whichever timezone you are in, drop an email to info@openwonderland.org to express your interest in volunteering and someone will help you sign up. I hope to see some of you on the Demo Server during my upcoming office hours. You are currently browsing the Wonderblog blog archives for September, 2011.